Heat oven to 350°F. Line 13x9-inch pan with foil so foil extends about 2 inches over ends of pan. Grease bottom only of foil with shortening or cooking spray. In medium bowl, make brownie batter as directed on box--except stir in butterscotch-flavored chips. Spread in pan. Bake as directed on box for 13x9-inch pan. Cool about 1 hour before frosting. In 2-quart saucepan, melt butter over medium heat. Stir in brown sugar. Heat to boiling, stirring constantly. Reduce heat to low. Boil and stir 2 minutes. Stir in milk. Heat to boiling; remove from heat. Cool about 45 minutes or until lukewarm. Gradually stir in powdered sugar. If frosting is too thin, place saucepan of frosting in bowl of cold water. Beat frosting until smooth and thick enough to spread. If frosting becomes too thick, stir in additional milk, 1 teaspoon at a time. Lift out foil and brownie from pan; carefully remove foil. Spread frosting over brownie. Arrange pieces of pretzel sticks to make tree and fence designs. Add candies to complete the "scary night" landscape. For brownies, cut into 6 rows by 4 rows. Store tightly covered. If using a dark or nonstick pan, shorten the bake time by 3 minutes. If using an insulated pan, lengthen the bake time by 7 minutes. Try one of Betty's newer brownie mix flavors, such as peanut butter, in this recipe. Just prepare the brownies as directed on the box. 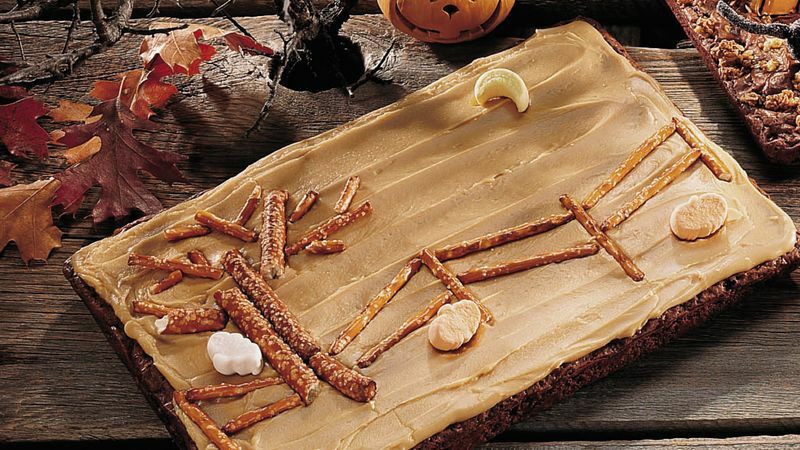 Trick-or-treaters will find big chunks of peanut butter-flavored chips in the brownies!